In the studio, Jeff was busy working on his multi figure painting and was resolving the face of his daughter. 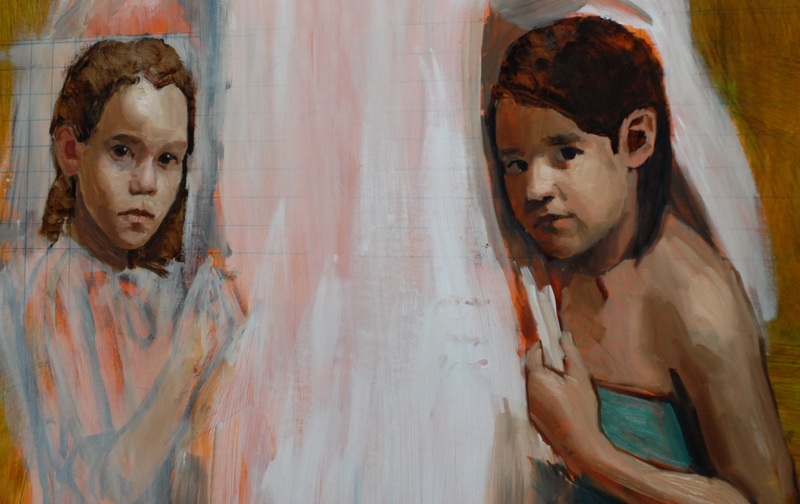 Her face has the base layer of painting on it, although a little bit more resolved then the other child at this stage. I am enjoying seeing how her face is painted up close, and the brush strokes, even though I know that most of this will be painted over in the layers to come. Jeff is seriously considering adding in other children, and is making plans to have them come in to the studio to sit for a drawing session. I am excited to see the progress made on it, as I heard about the sketches of the additional children on the canvas, after I had already left. I will make sure to post those for tomorrow’s update. Ciao! This entry was posted in Process and tagged art, art classes in Utah, art instruction in utah, base layer in painting, Fine art, Hein Academy of Art, jeff hein, oil painting, painting, Painting from life, reference drawings, Salt Lake City, Utah Art. Bookmark the permalink.